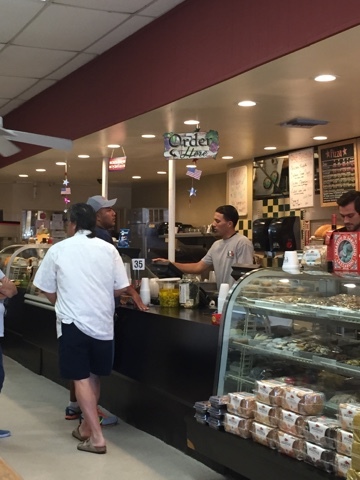 This is truly a hidden neighborhood gem tucked away in a non descript strip mall in Whittier. 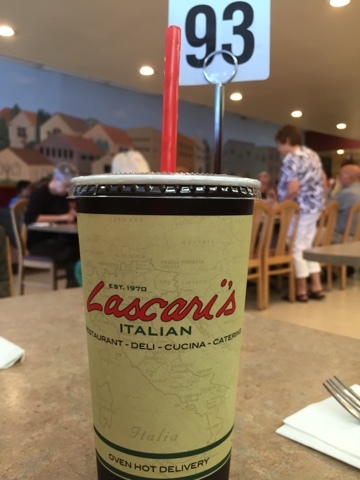 The first thing I noticed when we walked inside was it was bigger than I thought.You are greeted by a fairly large dining area, and along the perimeter are the food choices: from the deli (prices posted on the chalkboard on the wall), the gelato, the pizza, and the order desk. So if you want to order food, veer to the right, and there’s a sign floating on the ceiling that says “Order Here”. The staff can be relatively curt with you if you can’t decide what you want. The generic menu posted on the wall behind the counter doesn’t help, so take the paper “to go” menu for a better description of the food. 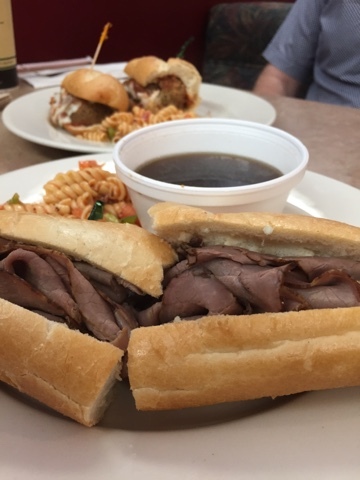 I was craving a meatball sandwich, but also saw their special of the day was the roast beef dip, served with au jus. Both sandwiches sounded so good, so we ordered both and shared them. The sandwiches comes with a side: pasta salad, potato salad, ambrosia, cole slaw or jello. We decided on pasta salad. We were told to find a seat, and they would bring the sandwiches to us. 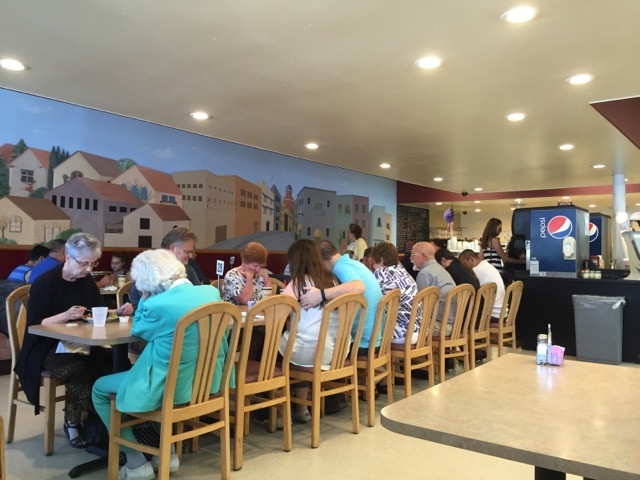 We were lucky to have arrived right before the lunch rush, or for a Sunday, the post church crowd, and found a booth in the corner of the dining area. As we were waiting for the food, the tables began filling up, and the place got very busy. It didn’t take long for the food to arrive. The small sandwiches looked like they could be 8-inch, definitely bigger than any 6 inch sandwich at Subway., and served on a long and thin Italian roll. The bread was crunchy on the outside, soft on the inside. The roast beef was good, but nothing spectacular, and went well with the au jus. 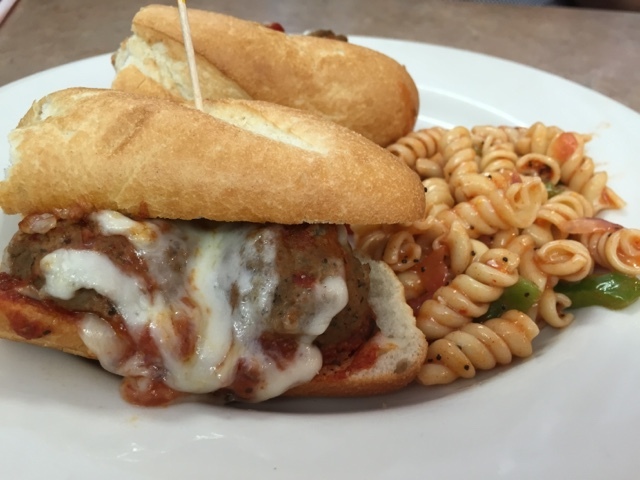 The meatball was good, not too saucy, and relatively cheesy. The meatballs were tender, not chewy or dry. I would get this again, perhaps even upsize to a large. The pasta salad that came with the sandwiches was good. The pasta was al dente, tossed in a light tomato/ marinara sauce, and with a hint of vinaigrette. Overall, a good lunch. We left satisfied, but not stuffed, and I would return again.